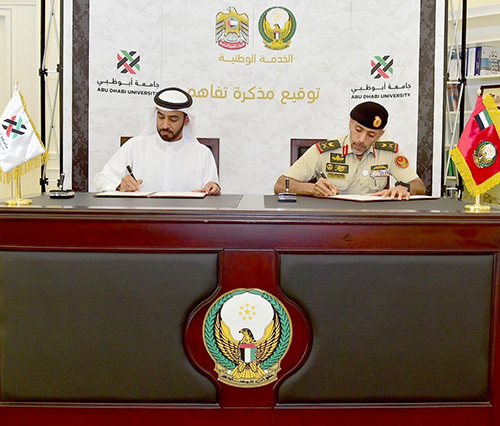 The general headquarters of the UAE Armed Forces, represented by the National and Reserve Service Authority, NSR, has signed an agreement with Abu Dhabi University for cooperation in scientific, academic and training fields, Emirates News Agency WAM reported. The agreement was signed by Pilot Staff-Brigadier Sheikh Ahmed bin Tahnoun bin Mohammed Al Nahyan, Chairman of the NSR, and Ali Saeed bin Harmal Al Dhaheri, Chairman of Abu Dhabi University’s Executive Board. According to the agreement and with support from H.H. Sheikh Hamdan bin Zayed Al Nahyan, Ruler’s Representative in Al Dhafra Region, Abu Dhabi University will provide 20 free scholarships annually to the top 20 NSR recruits. The University will also offer a 20 percent discount on tuition fee for the NSR recruits who have completed their service, provided they meet the eligibility requirements set by the Ministry of Education. The NSR also signed an agreement with the Skyline University College, under which, a scholarship fund will be created for the NSR recruits and the children of the UAE Armed Forces' martyrs. The fund will be used to offer 25 to 50 percent discounts in tuition fees to the NSR recruits.